If you are a collection agency or other business – privacy compliance and concerns have been on the rise and on the minds and agendas of our elected officials. The free Collection Agency File Decimator software securely delete files from your computer and protects your unwanted data. Just add the files you want decimated, then select how many times the data should be wrote over and shredded before it is deleted from your computer forever. Make sure your data never is seen by prying eyes, hackers, or by anyone that could create a liability for your or your business with the free Collection Agency File Decimator downloadable software. 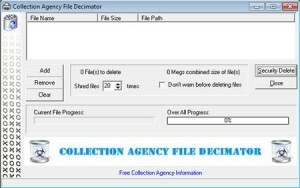 Download our 100% free and very easy to use file deletion software: Collection Agency File Decimator.